The Mitsubishi A6M Zero, often called just the A6M Zero or simply the Zero was a long range carrier ship-based fighter aircraft of the Imperial Japanese Navy during World War II. The aircraft was built by Mitsubishi, making its first flight in 1939, and entering naval service in 1940. It was the primary fighter used by Japan during the war. It was the primary enemy of US Naval aircraft such as the Grumman F4F Wildcat, Vought F4U Corsair, and later the Grumman F6F Hellcat, which was specifically designed to combat the Zero. The A6M Zero was the best fighter at the beginning of the Pacific war. However, late in the war, new American fighters were able to defeat it. ↑ This airplane type was named "zero" because it entered service in 1940; and 1940 was the 2600th year since Emperor Jimmu, the first Emperor of Japan. The Japanese Imperial Year was Kōki 2600 (皇紀2600年). 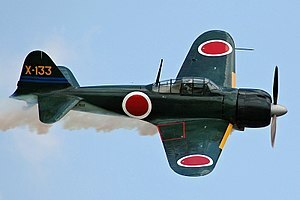 Wikimedia Commons has media related to Mitsubishi A6M Zero. This page was last changed on 30 July 2018, at 18:31.